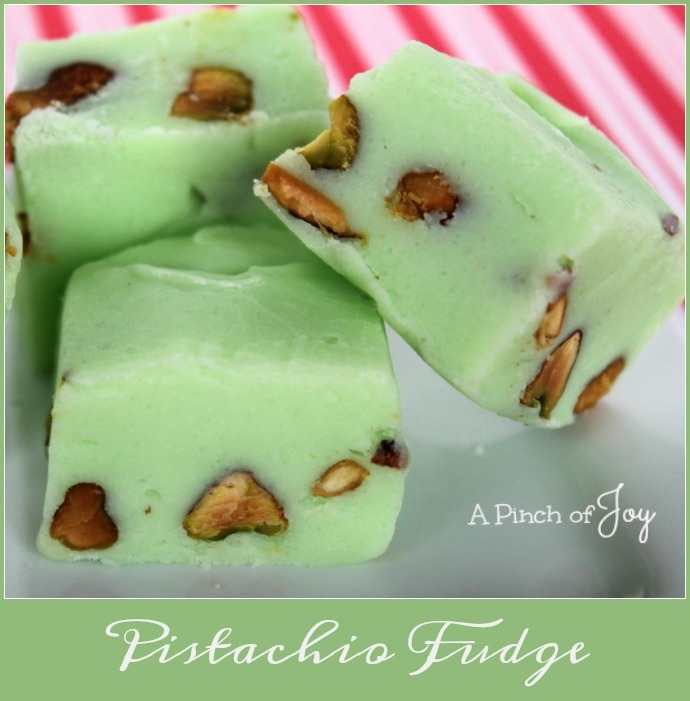 Pistachio Fudge makes a pretty addition to a candy plate or a dessert buffet. It is quick and easy to make – almost foolproof. (I used a handmixer to make it even easier and to ensure everything was well mixed.) The fudge has a smooth, almost fondant like texture that contrasts nicely with the crunchy pistachios. It’s delicate flavor surrounds the robust nut flavor for a nice balance. Pistachios are a member of the cashew family and are nutritionally dense with proven health benefits. There ya go . . . Enjoy! 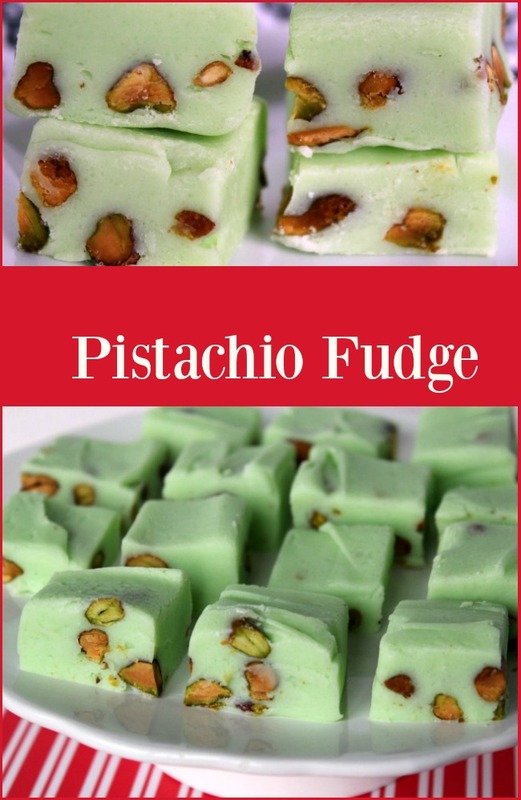 Pistachio Fudge makes a pretty addition to a candy plate or a dessert buffet. in a large microwave safe bowl, microwave white chocolate chips, butter and water on high for 1 minute. Remove from microwave and stir until white chocolate chips are are fully melted. if necessary microwave for an additional 30 seconds. Stir dry pudding mix into white chocolate mixture until completely combined. Add powdered sugar one cup at a time, stirring until well blended after each addition. Fold in shelled pistachios. Press fudge mixture evenly into prepared pan. Refrigerate for 2 hours or until firm. Remove fudge from pan and remove foil. Use a sharp knife to cut into 1½ inch squares. I have pinned both of your Fudge recipes, Charlene. My husband loves Pistachio, he will really enjoy this fudge. We really appreciate you sharing with us at Full Plate Thursday and hope you are having a great day! This Fudge sounds crazy delicious! Looks so pretty and Christmasy! I’ve had pistachio pudding, but never tried pistachio fudge. Looks good! Have to put it on my list to try. Pinning! It was new to me as well. Glad I tried it and hope you like it too! !